Turkey is not meat that is often thought about outside of a holiday or on the occasional sandwich. And when not cooked properly, it tends to be dry and tasteless. Blah! I have made hundreds of turkey meatballs in a quest to find the perfect balance between flavor and moistness. Finally, I created a recipe that works. 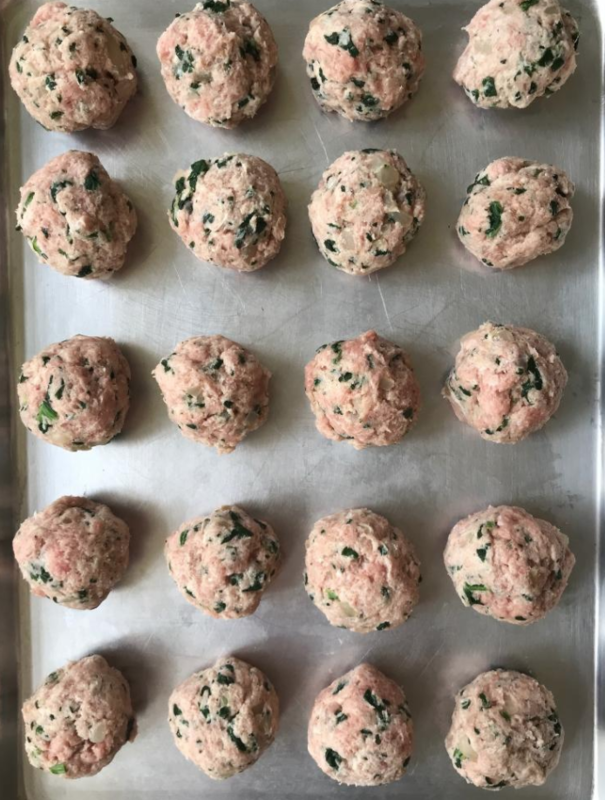 I have added spinach to the recipe to give the meatballs some color and texture. You can use fresh spinach as well, but chop it up before cooking. These little lumps of splendor can be served alone with a salad, disguised for beef meatballs in a tomato sauce, or layered on top of pasta pesto for a new classic. Oh how wonderful is a meatball. In Italy, meatballs are often made (depending on region and family) with different types of meat- just like in a bolognese sauce. 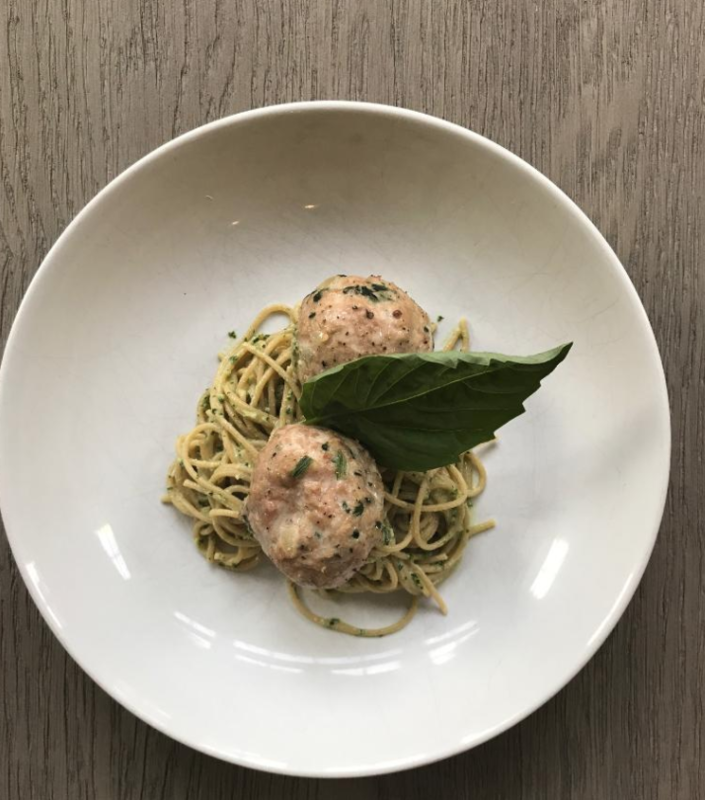 I do not recommend using anything but turkey in this recipe since the consistency of turkey meat is quite particular, and I developed the recipe as an alternative to a beef based meatball. With turkey meatballs, it is often difficult to get seasoning (salt and pepper) correct. Sometimes, I cook a tablespoon size meatball in a saute pan, taste it and adjust salt and pepper. Add a little olive oil to medium sauté pan over low heat. Mix in the onions and cook for 3 minutes.. Put the spinach into pan and cook another 4 minutes. Add the garlic and cook for 3 minutes. Set aside. Place ground turkey meat into a large mixing bowl. 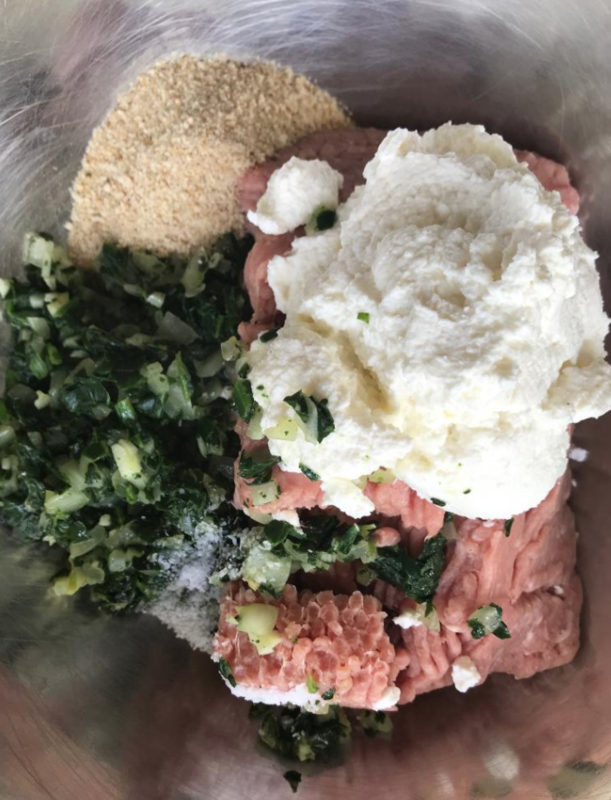 Add in the spinach mixture, ricotta, bread crumbs and pecorino cheese. Sprinkle a little salt and a few good grinds of pepper, mix well. With an ice cream scoop or large soup spoon, form meatball and place on a large baking tray. They do not spread so can be put close together. Bake for 25-30 minutes. If you want extra brown for last 5 minutes put oven on broil and brown the tops. Make sure you watch as browning.